This woman spends many hours at the L'Anse aux Meadows National Historic Site in Newfoundland, Canada as her job is one of an interpreter taking visitors back to the viking days. Dressed in time appropriate clothing, this woman will help visitors to L'Anse aux Meadows in learning how the vikings used to live and survive. Costumed interpreter at L'Anse aux Meadows National Historic Site of Canada and UNESCO World Heritage Site, Northern Peninsula, Great Northern Peninsula, Viking Trail, Trails to the Vikings, Newfoundland, Newfoundland Labrador, Canada. 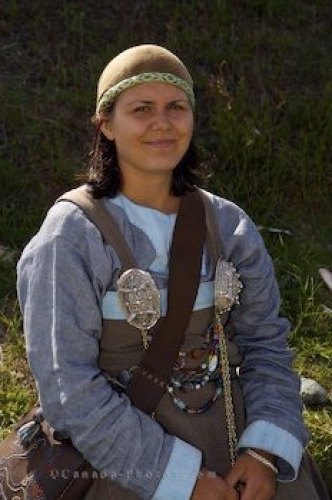 Photo of a woman whose job is an interpreter at L' Anse aux Meadows, Newfoundland, Canada.